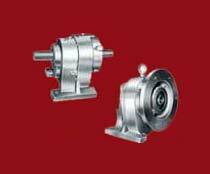 We are listed at the apex amidst the list of prime Helical Inline Gear Boxes Manufacturers and Suppliers located at Mumbai, Maharashtra. The Helical Inline Gear Boxes offered by us are designed and made by talented engineers with optimum material and advanced techniques. These Helical Inline Gear Boxes appropriate material are known as ADOPTA. Gear Boxes highly preferred by the clients for their high efficiency and durability. Clients can avail Helical Inline Gear Boxes at market leading rates from us.